A potentially life-saving initiative aimed at reducing collisions involving vulnerable road users and construction vehicles has been released by the Construction Logistics and Community Safety (CLOCS) project. CLOCS, an industry-led project sponsored by Transport for London (TfL) to reduce injuries and deaths due to work-related road risk, has developed the CLOCS Standard for construction logistics: Managing work related road risk. The Standard outlines a common road safety framework for use by the construction logistics industry and aims to achieve far-reaching changes in the way the industry manages potential dangers to cyclists, pedestrians, motorcyclists and other vulnerable road users. When a developer and construction company adopts these standards, trucks delivering to their sites will have to meet rigorous safety standards and to date 58 organisations, including many of the UK’s leading developers and construction firms, now fully support the CLOCS programme. This hugely important work will help improve safety standards and reduce the number of collisions between trucks and vulnerable road users. Road safety is one of our top priorities as we work towards a 40 per cent reduction in, and ultimately the eradication of all, death and serious injury from roads. I would therefore, like to personally thank all of our CLOCS Champions for helping to make the UK’s streets safer for everyone who uses them. The CLOCS Standard is implemented by construction clients through contracts and provides a framework that enables ownership in managing road risk which can be adhered to in the same way by all fleet operators. This standardisation is aimed at increasing the understanding of road risks and collision trends in order for managers to learn from incidents, share lessons they have learned and manage potential risks. It corresponds with the Scheme’s own five-point Code of Considerate Practice, which includes the section ‘Secure everyone’s Safety’ and asks registered sites, companies and suppliers to have systems that care for the safety of the public, visitors and the workforce. When Scheme Monitors visit those who have registered, included within the safety section of the Checklist is question 4.7 which asks, ‘What is done to ensure that the movement of vehicles and plant outside the site is not a risk to pedestrians, cyclists and other road users?’. Monitors would hope to see that there are processes and actions put in place which help prevent the possibility of accidents with pedestrians and cyclists. Last year, the Scheme also developed its ‘Spotlight on…’ initiative that looks at different areas associated with improving the image of construction, and raises awareness among registered sites, companies and suppliers on how they can help with the issues. The first topic which had a spotlight shined upon it was cycle safety, and the importance of ensuring there are safety systems and processes in place to prevent accidents between construction traffic and cyclists. Research showed that there are many organisations out there, both industry and non-industry based, that are working to make cycling safer, including TfL who are at the forefront of developing and implementing safety initiatives. 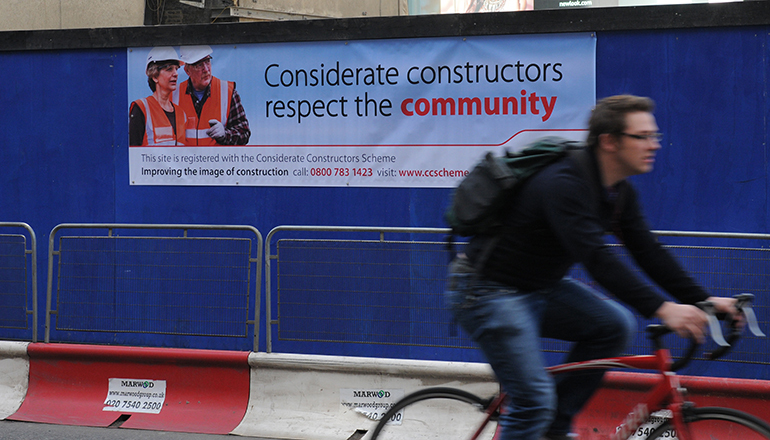 The Scheme’s ‘Spotlight on… cycle safety’ page can be used as a central hub for construction companies to visit in the first instance where they can find statistics, links to current campaigns, best practice and case studies on safer cycling. The CLOCS Standard acknowledges a number of organisations that have assisted with its development, which includes the Scheme as well as a number of its own Associate Members and Client Partners. 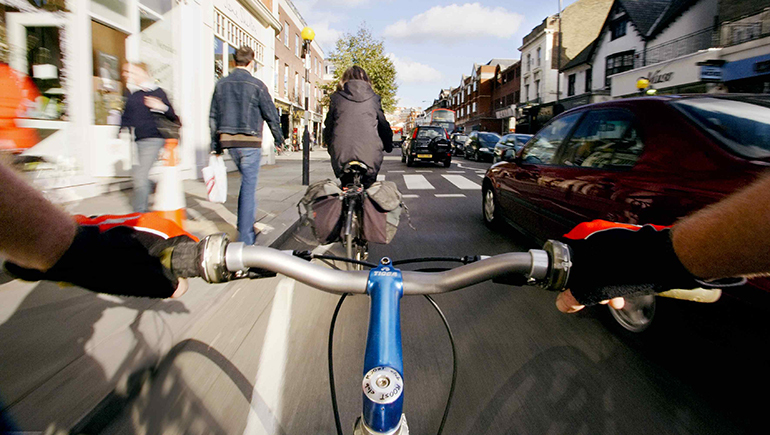 Cycle safety and the safety of other vulnerable road users are very important to us at Mace. As our roads get busier, reducing the risks associated with construction logistics is an inherent responsibility for the industry, and the CLOCS Standard is an important step in reducing this risk. Having worked closely with TfL to develop the standard we now have a collective responsibility as an industry to fully embrace CLOCS – an holistic approach is the only way we’re going to effectively address this critical issue. CLOCS recently hosted a stand and presented at the Scheme’s ITIOC (Improving the Image of Construction) event in Nottingham to raise awareness of the standard, and their organisation’s aim, with the industry.